Have you started to decorate for Valentine’s Day? I just pulled out the decor and put up a little bit in one room. 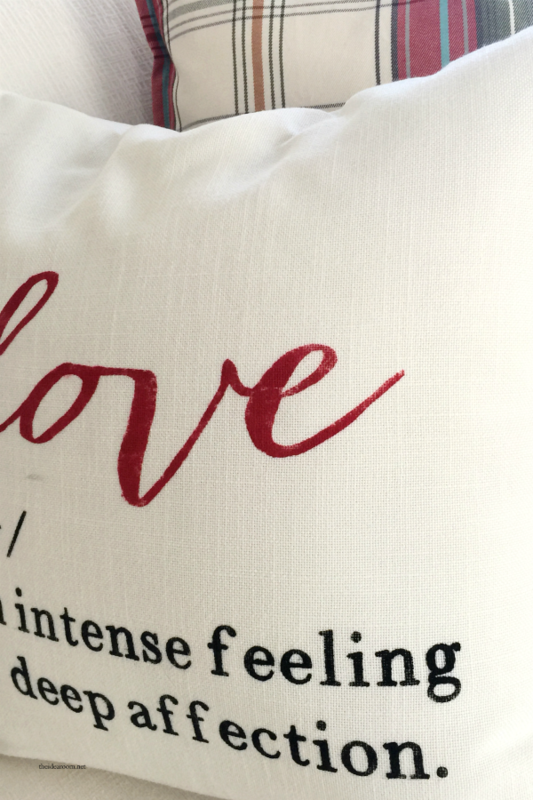 I have been wanting to make a Valentine’s Day pillow for my white couches. I finally had a chance to make one and I am really enjoying it! I created a stencil using freezer paper and some vinyl with my Cricut Explore. I ended up using freezer paper for the word “love” because the font wasn’t translating well and I am kind of a perfectionist… :)!! 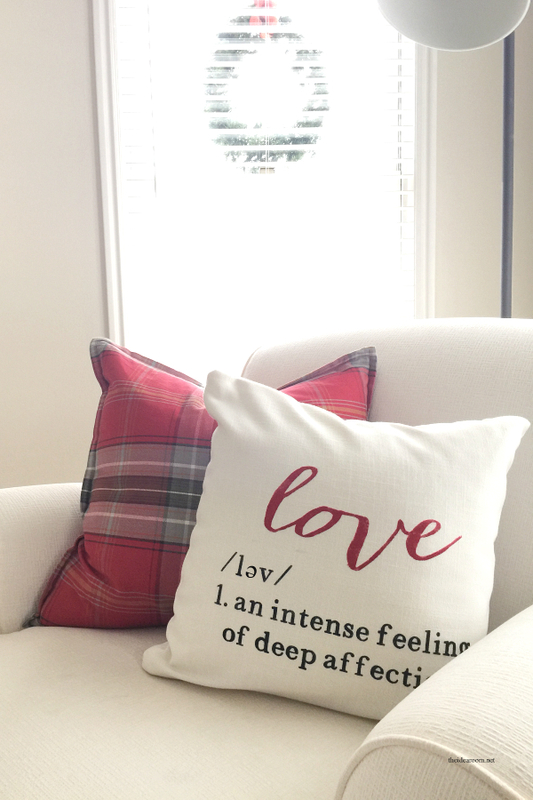 I used the vinyl to cut a stencil so I could use fabric paint and paint the definition on my pillow. 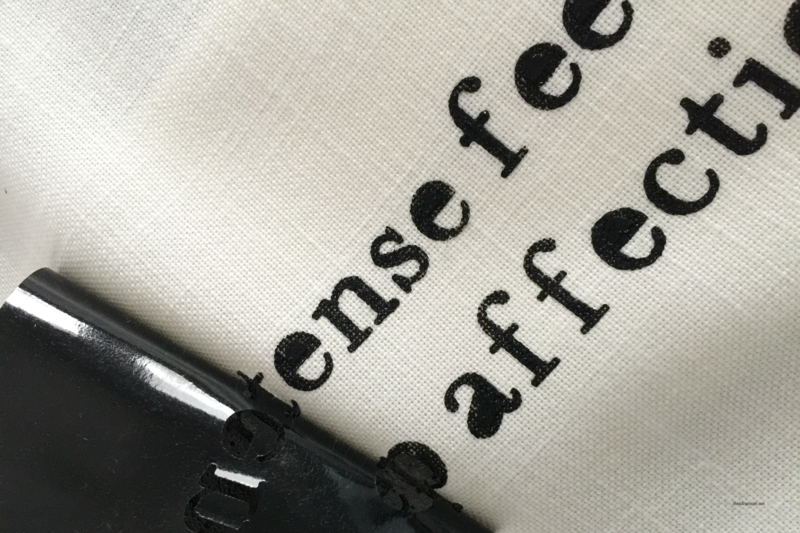 I like that the font looks a little more distressed as opposed to using an iron-on material. 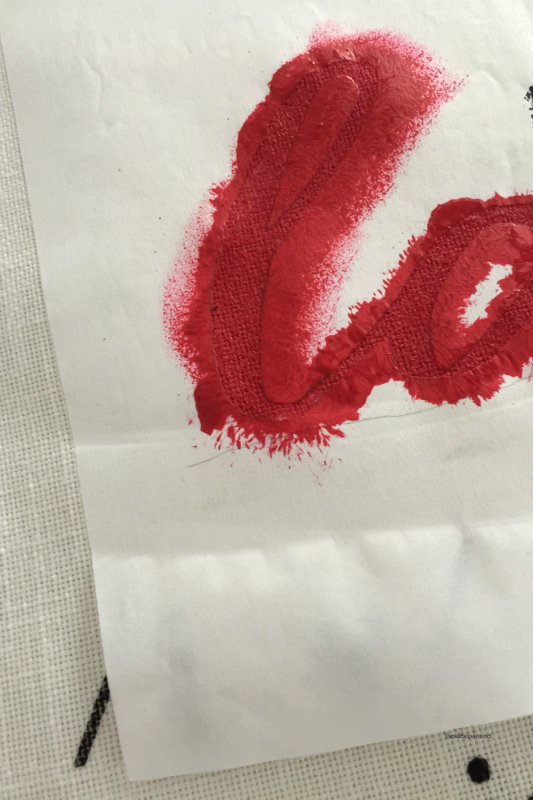 If you haven’t used Freezer Paper to make a stencil you really need to give it a try! Freezer Paper works great and it’s pretty inexpensive for a giant roll! I printed the word onto a piece of computer paper after sizing it the right size for my pillow (16 inch square pillow). Then I placed the freezer paper on top of the printed word with the shiny side of the paper down. Trace your word onto the freezer paper and then cut out the word with scissors. Be sure to keep any of the insides of the letters and place them in the proper spot. Then iron the freezer paper onto your pillow. Take your fabric paint and sponge it onto the material. Be sure to put a paper towel or small piece of paper under the material so that the paint doesn’t bleed through the fabric onto the back of the pillow. Want to make one for yourself? 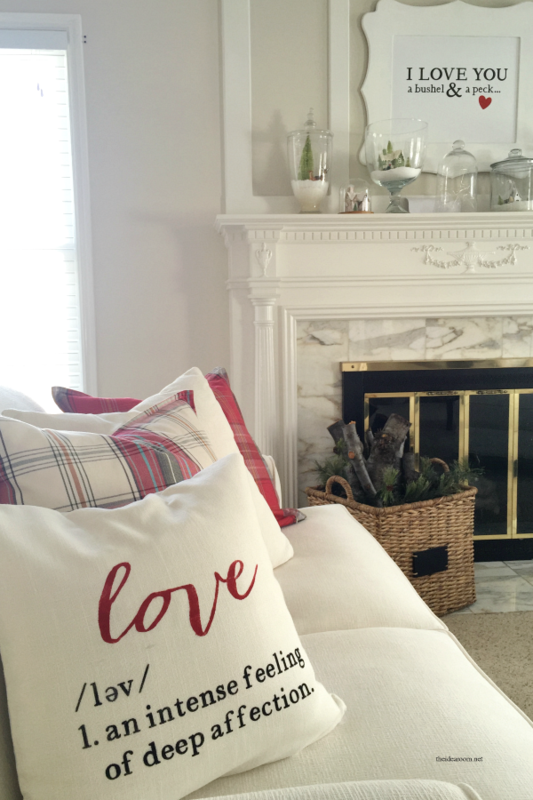 You can make your pillow cover using this step-by-step tutorial I shared for how to sew an 18 inch pillow cover. They are so easy to make! Then download these printables to make your own stencils! *As always, these are provided for your personal use only. Please do not sell or re-distrubute these on your own sites or sell them in your stores or craft fairs. Thank you! 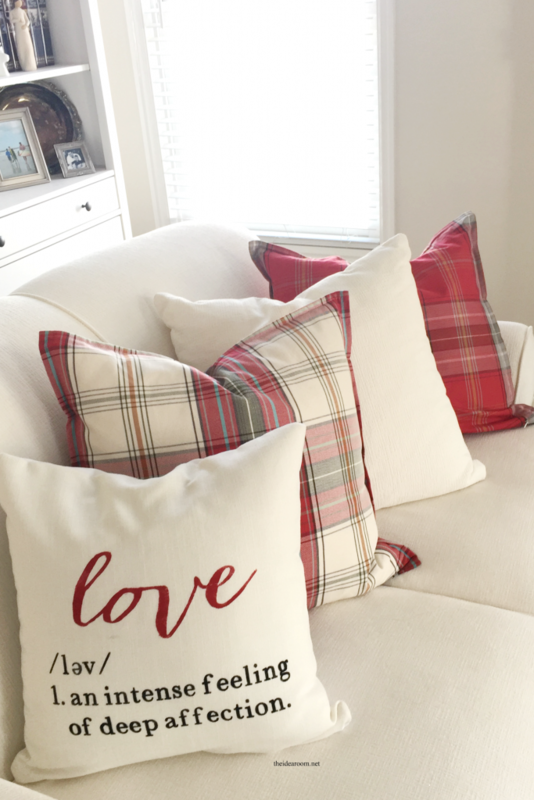 The plaid pillows are from Pottery Barn and you can find them here and here. 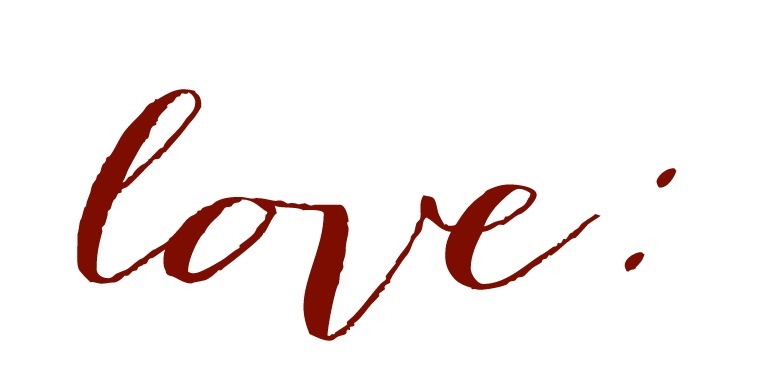 For the free “I Love You a Bushel & a Peck” Sign, click here. This is too cute! I “love” it. Thank you so much for sharing the downloads. I definitely will be making this pillow. I already printed the Bushel and a Peck last year. You ROCK! Thanks bunches. Patti, thank you so much!